I like that Star Wars has a variety of eras in which to tell stories, each with distinct rules and happenings, and that numerous stories can be told with the same characters through the various eras. At the same time, I do find this can lead to a dulling sense of inevitability in Star Wars fiction -- there's only so many stories to be told between New Hope and Empire Strikes Back before all the pieces have to be back in place, for instance. Writer Greg Weisman avoids any number of pitfalls in spinning the origin of Rebels's Kanan Jarrus in Star Wars: Kanan Vol. 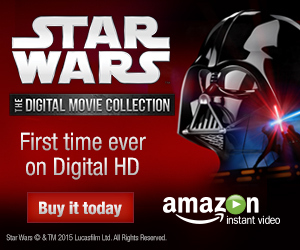 1: The Last Padawan, and delivers some surprises to boot. I had heard good things about this book and Weisman definitely impresses, with a story that challenges in some ways what it means to tell a Star Wars tale. Weisman smartly sets his first chapter just before Chancellor Palpatine issues Order 66, such to present almost a whole issue of Kanan, then Jedi Padawan Caleb Dume, at peace. "Peace," of course, is a relative term during the Clone Wars, something that the issue and indeed the whole book explores, that the times may be bad but Caleb can't help but feel satisfaction in finding meaning in his life. The chapter gives the reader a good sense of Caleb's happy life before Order 66, and his partnership with his eccentric master, so we understand on a more personal level what Caleb loses. The second chapter is equally good, as friend becomes foe and Caleb must flee the very clone troopers with whom he was just joking a moment before. I liked that Weisman made troopers Grey and Styles ongoing antagonists throughout the story, giving Caleb a personal (and tragic) connection to his "villains." Weisman and artist Pepe Larraz demonstrate in almost horror movie fashion the clone troopers' sudden turn against the Jedi and Caleb's flight from them through the wilderness. Weisman succeeds in making it all personal, showing the familiar Order 66 events from an individual's point of view; it's especially affecting how the hunted Caleb has no money, no food, and can't even stop to sleep for fear of being caught. Padawan "pivots" in the third chapter (also the name of the third chapter), and the third through fifth involve Caleb effectively leaving the Jedi behind to become "padawan" to a smuggler. There's a wealth of Star Wars fiction out there, of which I've only scratched the surface, but this cross-over of Jedi to smuggler felt new to me, as if most Star Wars stories involve either a Luke Skywalker or Han Solo, but rarely a character who acts as both. In a manner we're to see both as progressive but also sad on Caleb's part, he takes the Jedi purge as fait accompli and throws himself into smuggling. That Caleb has kept the Kanan persona all this time reflects just how affected he is by the loss of the Jedi, and that's something I hope either the remaining issues of this series or Rebels one day tackles. Caleb's partners-in-crime are smuggler Janus Kasmir and, eventually, Separatist general Kleeve (in reusing Kleeve, Gray, and Styles, Weisman seems to waste nothing in the book). It's a nice touch, in this story about the really early days of the Rebellion, that Weisman shows just how polarizing the Empire was. Even as clone trooper friends become enemies, Separatist enemies who opposed the Republic become allies as the Republic becomes the Empire. I also appreciated that Weisman takes a seemingly unique track here, and rather than Caleb's rebirth come from something redemptive like saving a village from the Empire, he renames himself solely based on a smuggler who was kind to him. This is clearly a Star Wars story, but one about loyalty among "bad guys," and I found that very refreshing. Weisman, a former Rebels producer, gets to essentially write an episode of Rebels with Padawan's final chapter (though the whole book would work tonally as a Rebels movie). Set in Rebels' present, the team returns to the planet where Kanan got his start as a smuggler. Though billed as an epilogue to this story, the chapter (and this book) ends on a cliffhanger; it's a curious choice on Marvel and the creative team's part, since the fifth chapter ended very definitively (with Kanan venturing out on his own) while the sixth chapter leads into the next volume -- all the better to suggest, perhaps, that Kanan's story past and present is all of a piece. The "threat" here -- hardly a threat really, and almost wholly in Kanan's head -- is that his friends will find out about his smuggling past, and I'm curious where Weisman goes with this especially since it could potentially change the Rebels dynamic, something I doubt the comic is allowed to do. My enthusiasm for licensed fiction waxes and wanes, with Star Trek winning out over Star Wars, at least novel-wise, in its ability to tell forward-going stories with the characters. 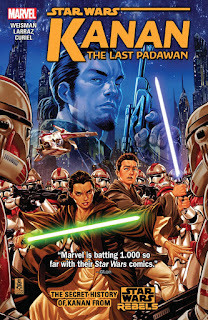 But Greg Weisman's Star Wars: Kanan Vol. 1: The Last Padawan lived up to the hype, telling a story with greater focus even on characterization than its plot, and one that serves to make me look at the Kanan Jarrus character a new way. I'm eager to see how the story resolves. This is the first time I have ever commented on your site. You are doing a wonderful job and I have read many graphic novels as a result of your reviews. Also by chance have you read the mini-series of Obi-wan and Anakin? I am intrigued by that one as well.